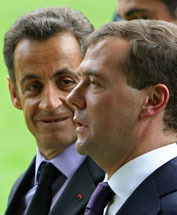 French President Nicolas Sarkozy and Russian President Dmitry Medvedev signed an agreement on August 12, 2008. Owing to the treaty, Russians suspended a military attack on Georgia. The agreement obliged Russia to return to the pre-war situation. However, Russia has not fulfilled the point and does not intend to do so. Instead, it recognized South Ossetia as an independent state. Now Russians are claiming that their armed forces are deployed on the territory of an independent country and not on Georgian soil. As it appears Moscow liked the policy it exercised in South Ossetia and repeated it in Ukraine. However, the scale is considerable bigger when it comes to Ukraine. Russia occupied Crimea and now is trying to carry out a similar scenario in the eastern part of the country. It should be stressed that Europe and the United States reacted more effectively concerning Ukraine and are trying to force Russia to step back. It seems that the Western countries are concerned and determined at the same time to make Moscow to concede. The Georgian population, as well as analysts and politicians keep asking if Georgia’s occupied territories might come back on the agenda. At the sixth year anniversary of the tragic event for Georgia, the Minister of Foreign Affairs released a statement, speaking about the current developments in terms of the occupied regions. The statement included the sections about ethnic cleansing, violating international legislation, the dismissal of human rights in the de-facto independent regions, etc. The statement also highlighted that there is not much progress achieved through the Geneva Talks. Of course, prior to signing the agreement with Sarkozy, the Kremlin had already developed a plan for the recognition of the occupied regions as independent states. Currently there are two approaches for Georgia regarding Georgian-Russian relations. The previous government believes that Georgia should be more aggressive in its statements towards Russia and permanently remind the West about the Russian occupation policy. However, the Georgian Dream coalition is trying to normalize a relationship with Russia and settle the recent confrontation through peaceful means. Unfortunately, the moves taken by Moscow with regard to Ukraine and its stubborn position regarding Georgia’s occupied regions reveal Russia’s small will for peace. Russia’s negative attitude concerning Georgia’s Euro-Atlantic path also makes it hard to improve relations with the country. Everything will clear up when Russia makes its next steps. However, Russia’s further steps will also be dependent on the principled position of the West.